You don't have to change a thing? Over the past year, I've grown into my own. I have felt my confidence rise, I trust myself, I like who I am. I am working on not being (too) hard on how I look or how I feel. 26 has been a good year so far for learning to love who I am. I actually took pictures of myself and liked how 95% of them turned out and never once thought "uch I look _______" once. For me, that is huge. Trying to learn to love who I am hasn't been easy, but I am happy I am working at it. 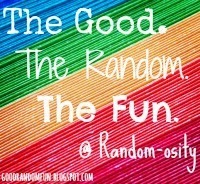 come join the Good.Random.Fun. each Monday, right here! I think most of grow into our own as we add the years. The duty of the ones further into the journey is to encourage those coming along the way. Yes, what Buckeroomama said. If you have self-acceptance everything else falls into place. Go you! Yay! These photos are great! I love your top! You are at a perfect time in your life. Enjoy my friend. Love who you are and 26 is a perfect age to start with it! Wonderful post -love every single image!Well done. cute photos. how tall are you? I always thought you were short, but in these pictures you look tall! I think you are pretty great! Good for you taking these self-portraits and loving them! It's so hard to do. You look great, but really it is your spirit that wins us over! Wonderful! And the self-portraits are fun. The second one is my favorite -- your confidence is clear to see! We are our own worse critics. How can we expect someone else to love us, if we can't love ourselves? You are truly on the right path. So much wisdom in your years Tamar :). Beautiful self portraits...love em all, but that last one I have a feeling prob captures the essence of the real you :). Thanks for linking up to Sobg-ography. Great post! I'm working on self-acceptance too... With not so many results! It's not just physical for me... I want to think to myself as a strong, intelligent woman, a mama that is great in what she does. Not perfect, but good enough! Great shots! Every year I have grown in self confidence....I'm just days away from turning 40 and it feels great to like myself. ooooh.... 26!!!! of course you are beautiful and perfect, plus you have the greatest treasure: YOUTH!!!! you go girl. i need to work on this myself. Love these photos! First of all...love the background you chose, the composition and your poses. More importantly, I love that you are so confident! You're gorgeous and wise beyond your years. Such a great collection of shots - love that you chose black and white...I am such a fan of b/w portraits! Your spirit really does shine through!! Love your selfies and loving yourself is so important to one's self esteem. You should be very proud and happy with where you are right now. That's awesome! Yeah, I think every year after the age of 25 I've just come more and more into owning myself. I don't always treat myself with love, but loving myself isn't always the huge effort it once was. So great to see you out in front of the lens, and looking so happy!